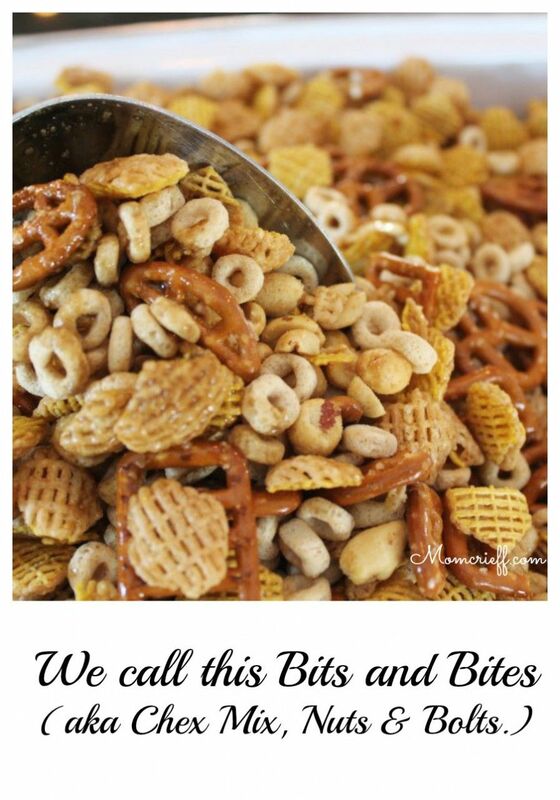 Whatever you call it, the Bits & Bites, Nuts & Bolts mix is sooooo good. Maybe the names I use for this mix are Canandian. I know I was trying to describe it to a friend and they responded with, “Oh, you mean Chex Mix.” The name doesn’t matter. The delicious, addictive taste does. I guess I do often use Chex Mix. Just not always. Not today. Because this is the beautiful thing about this recipe. It is versatile. You can adapt it. You make it yummy for your family. I’ll give you the ingredients I used and how I made it. Because you are awesome, I’ll give you a couple of variations in the ingredients that I have tried or have considered but not yet tried. This makes LOTS. Because it gets better as it ages for a couple of days. Because I always give some away. And the bits & bites are always appreciated! (Ingredients can be customized to your family. Use a little less of other ingredients if you are substituting. 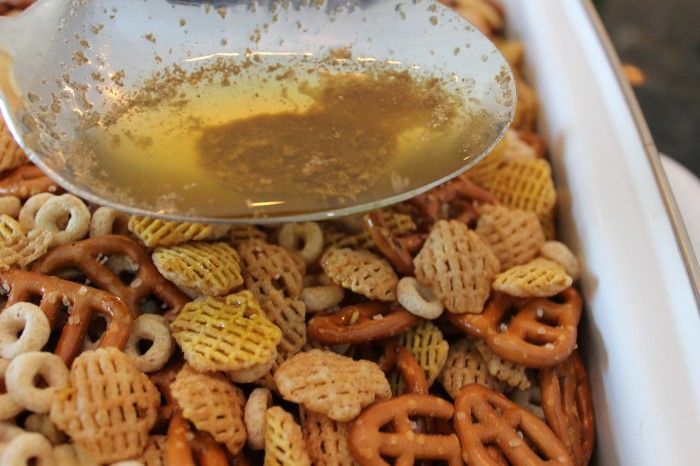 Try Cheesits, goldfish crackers, whole wheat Chex cereal. For the seasonings, you can also substitute onion salt for the celery salt). Preheat oven to 250 Fahrenheit. Get the biggest roasting pan you own. Or two of them. Or buy a couple of aluminum pans. Like I mentioned earlier, this makes LOTS! Get a BIG roasting pan. Or use two. 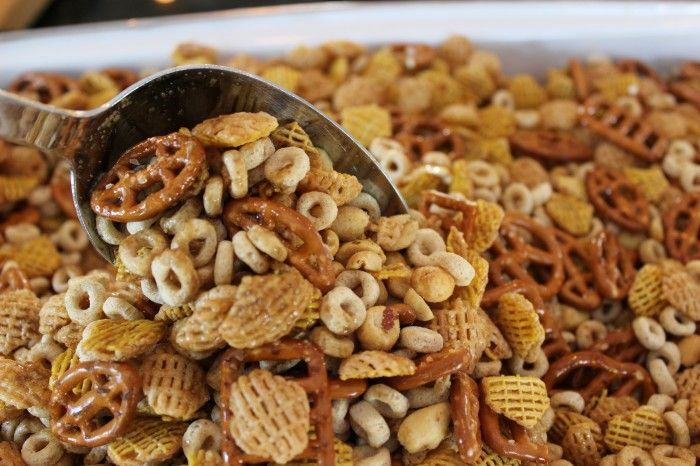 Mix all the cereal, peanuts, pretzels together. These bits & bites are meant to be shared! It makes lots but stores well. Add the other yum stuff. Wait with the cheese puffs. They don’t do too well with all the seasonings poured onto them and with the heat. We’ll add them later. In a saucepan, melt the butter. Easy on the heat, you don’t want to scorch it. Add the oil. The original recipe I received used all butter. 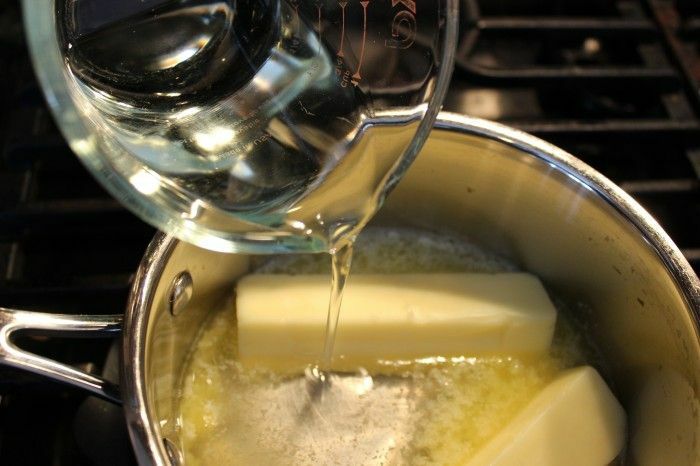 I’ve reduced the total amount of oil already and switched some oil for the butter. I’m so confused! Is butter bad for you now. Was it, is it? I don’t know! But you need it for this recipe. For some reason it just tastes better than if you use all oil. Slowly melt butter, add oil. Take off the heat and let cool for a couple of minutes. 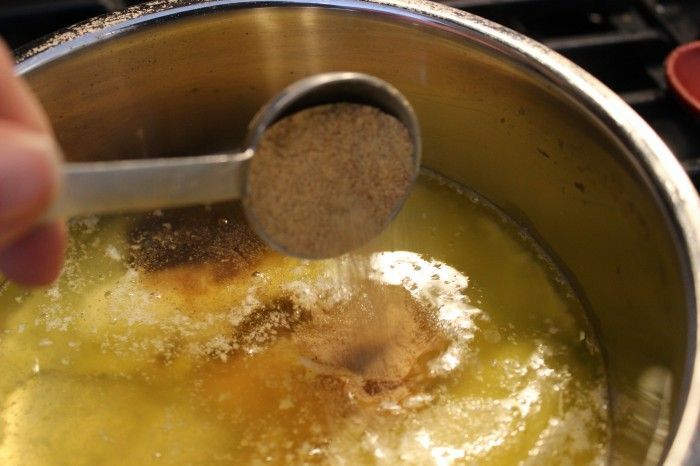 Then take a large serving spoon, stir your mixture of goodness and make sure you grab a spoonful of the oil & seasoning mixture. The seasonings don’t all dissolve. That’s ok! 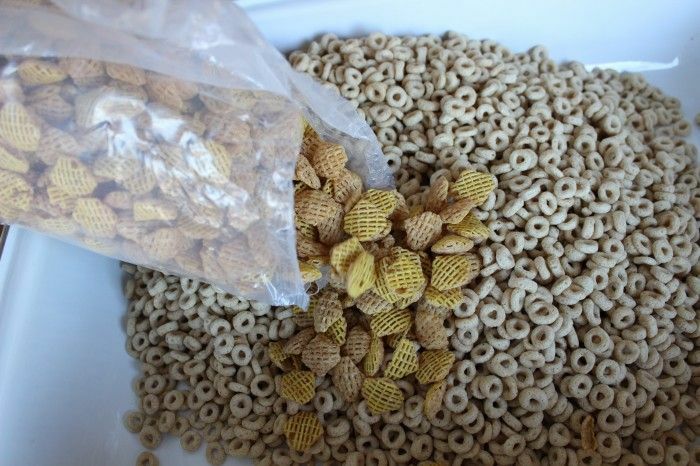 Drizzle over the top of the cereal mixture. 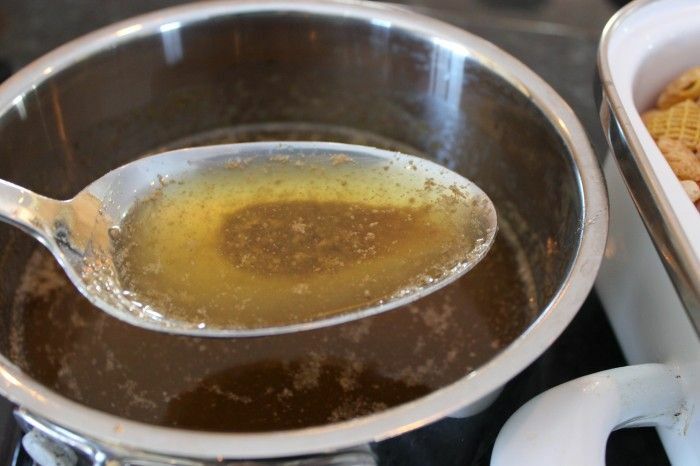 Continue until you have used about 1/3 of your oil mixture. Drizzle the oil and seasoning mixture all over the cereal mixture. Then mix well. Put into your preheated oven. After 15 minutes, stir the mixture well. Add some more of the oil and seasoning mixture. Repeat. After an hour in the oven at 250 turn the oven off and leave the mixture in there. Leave it for at least 4-5 hours or overnight. Give it a good stir every few hours. Unless you are leaving it overnight. You don’t need to wake up in the middle of the night to stir it :). Stir every 15 minutes and add some more flavored oil and seasonings. Now is the time to add your cheese puffs. Make sure you have the puffed ones. Not the hard crunch ones! Stir them into the mix. 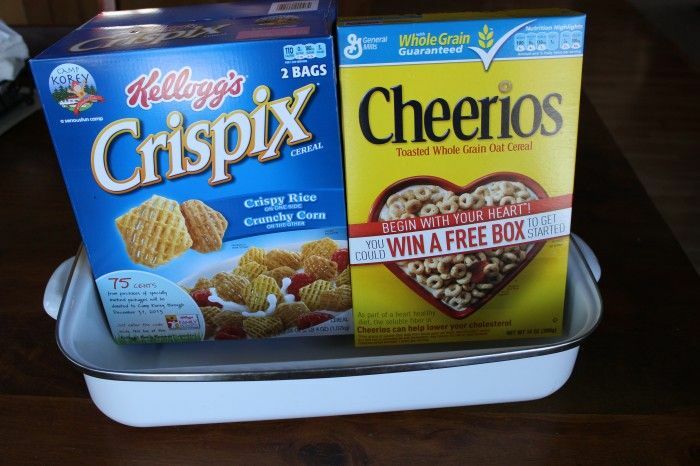 You may need to use an additional container or big bowl. The cheese puffs will absorb some of the flavors when they are being stored. 1. That popcorn container you kept from last year. 2. Any large food container. I put mine in batches into gallon sized closable plastic bags. Even if you put your bits and bites in a large container, I recommend using the plastic closable bags. It just helps keep the flavors in and prevents staleness. If you keep them sealed, they will last up to about 2 weeks. If there are any left. 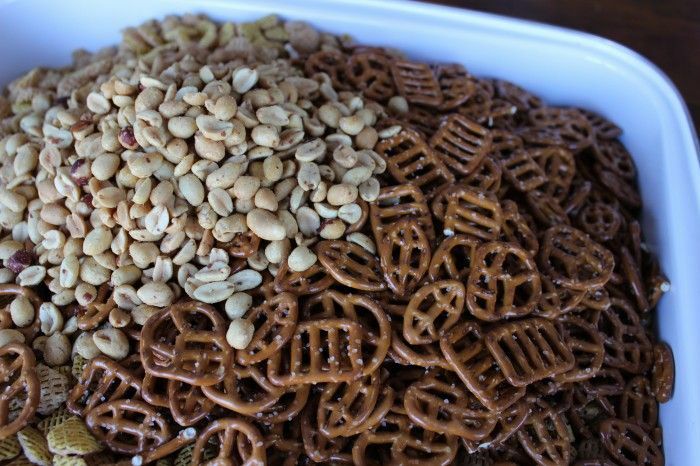 « Pretzels with Hershey Kisses – make Christmas themed ones! Freezing them is a great idea! My recipe makes a huge batch. I freeze them so i can do them ahead of Christmas time and use for different get together’s. i fine they still taste great. Thanks! I make these every year and my teen boys just love them! I love your post. I am going to make your Bits and Bites! They look so yummy.